Our priorities were to restore any damaged areas, and refinish the floors after many years beneath carpet. 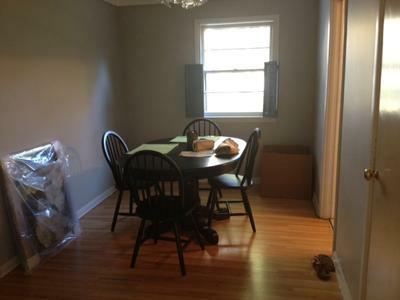 Yes, there was plywood in the doorway that was patched, the wood floor repair was matched perfectly and you cannot tell it was a patch. The value increase is obvious, it makes each room feel bigger and brighter. It looks cleaner and adds functional value as well, as it is easier to clean and maintain in the long term. Thank you, Sarah. Two things about this job made it extra enjoyable. First of all, it's always fun to make a wood floor repair look like nothing ever happened. Very, very common to find missing flooring under the carpet. You peak under the carpet in a corner while looking at the fixer-upper and find the treasure you are looking for--a hardwood floor! 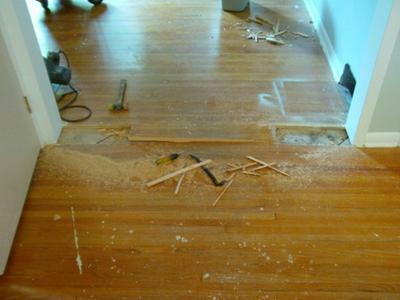 Antique wood floor repair requires antique flooring. he knows how to harvest flooring from the existing floor to make the repair. Your floor required a little of both, actually. I re-used the flooring from the middle of the opening in the photo and added some matching material from my vast inventory. 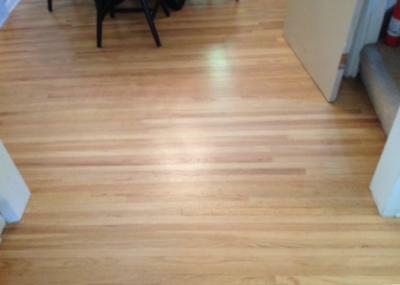 As an antique floor guy, I periodically return to homes through the years to add on or maintain or repair a wood floor. In the process, I get to watch the kids grow up. How fun to have been of service to your folks and now you.